Reuven is quiet and thoughtful. His younger brother Avi is outgoing and impulsive. As irritating as they can be to each other, the boys have two strong bonds-the solidity of their Jewish family life and their passionate love for baseball. 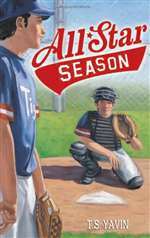 As the book opens, Reuven, a pitcher, is desperately working for a spot on the end-of-season All-Star team, while happy-go-lucky Avi probably hasn't even thought that far ahead.